PROTOTYPE BUILT FOR PRINCE CHARLES' ROYAL GARDENS"
The Pallet House prototype designed by I-Beam Design was featured in HRH Prince Charles' Royal Gardens as part of an exhibition on sustainable design, organized by Prince's Charities, Start, along with The Earth Awards, The Financial Times and IBM. The interior was decorated by Wallpaper magazine. Pallets are specifically designed for transport and delivery - so cost is negligible when carrying shipments of food, medicine and other types of aid to refugees. A 250 square foot 'Pallet House' requires 100 recycled pallets nailed and lifted into place by 4-5 people using hand tools in under a week. The Pallet House won an award from Architecture for Humanity in 1999 and has since been featured in numerous books and journals including the New York Times, Wall Street Journal, El Pais in Spain La Republica in Italy and Architecture for Humanity's seminal book "Design Like You Give A Damn". In addition to the prototype for the Earth Awards, I-Beam Design has built Pallet structures in New York, Indiana, and at the Architecture Triennial in Milan. They are currently working on housing for people who lost their homes during the earthquake in Haiti and Pakistan. I-Beam Design, founded in 1998 by Suzan Wines and Azin Valy, is an award winning architecture and Design firm based in NY. Their key personnel have a broad range of design and construction experience including corporate, commercial, cultural, landscape and residential projects. "I-Beam Design repurposes the abandoned, rethinks the readily available, and celebrates future possibilities." The Pallet House, by I-Beam Design, was conceived as a transitional shelter for refugees returning to Kosovo. There was a need for an alternative shelter to the typical tent solution that could transform a temporary living condition into a permanent home. It is an inexpensive, efficient and easily realizable solution to the problem of housing people displaced by natural disaster, plagues, famine, political and economic strife or war. It has since become our aim to develop the project to serve not only refugees in disaster stricken areas but also as a modular, prefabricated solution to affordable housing everywhere that can improve people's lives, the environment, society and even inspire greater diplomacy among the various cultures of the world. The principal building module is the wooden shipping pallets which are versatile, recyclable, sustainable, easily assembled and inexpensive. They are readily available in most countries and their transportation cost and weight is negligible when used to carry shipments of clothing, food, medical supplies or other relief aid. A simple pallet structure evolves naturally from emergency shelter to permanent house with the addition of more stable indigenous materials like rubble, stone, earth, mud, plaster and concrete. The evolution of one 16' by 16' shelter into a permanent home requires approximately 100 palettes nailed or strapped together and lifted into place. Tarps draped over the basic structure or plastic corrugated sheets prevent water penetration until enough debris, stone, mud, earth, wood, corrugated metal or any other materials from the immediate surroundings can be gathered to fill the wall cavities and cover the roof. Pallets may be pre-assembled with styrofoam insulation, vapor barrier, plywood or corrugated sheathing prior to shipping. As infrastructure is restored and cement or other materials become available the filled pallets can be covered with stucco, plaster, or roofing tiles transforming the makeshift shelter into a permanent home within a year or two. Consequently, the Pallet House adapts to almost every climate on earth and the basic structure can be built in less than a week. The pallet module provides great flexibility in terms of configuration, allowing each family to build according to their own needs and size. The Pallet House has won an Honorable Mention in the competition for The Returning Refugees of Kosovo. It has been featured in numerous journals including the New York Times, Spain's "El Pais". Italy's La Republica, on line exhibit of the 2000 Venice Architecture Biennale titled "Less Aesthetics, More Ethics" and is included in the book "Design Like You Give a Damn". In addition, this project has received grants from NYSCA and the LEF Foundation and will be exhibited as an installation at a New York City public park this summer. Most recently, I-Beam Design was invited to build a full-scale Pallet House prototype for the Casa per Tutti Exhibition (May-September 2008) at the Architecture Triennale in Milan, Italy where other prototypes by Massimiliano Fuksas, MVRDV, Kengo Kuma and Alejandro Aravena were featured. Architecture and construction have a huge impact on the environment and society; and the recent disasters in China, Myanmar, Iraq, Darfur, Afghanistan, and New Orleans continuously remind us of the symbolic, cultural and physical power of buildings. But there is another more pressing architectural crisis that affects all nations: the question of housing the 1 billion people who live in substandard housing around the world. Pallet House provides a viable and adaptable solution to the housing crisis while simultaneously empowering individuals with simple materials and tools to rebuild their lives and communities. Therein lies architecture's greatest contribution to humanity. The Pallet House project by I-Beam Design, was initially conceived as a transitional shelter for the refugees returning to Kosovo after the war. These people needed an immediate alternative to the typical tent solution that could potentially transform into a new permanent home over time, even without access to sophisticated tools and materials. It has since become our aim to also develop the project as a more permanent housing solution to serve not only refugees in disaster stricken areas but also as a modular, prefabricated solution to affordable housing everywhere that can improve people's lives, the environment, society and even inspire greater diplomacy among the various cultures of the world. The Pallet House is an inexpensive, efficient and easily realizable solution to the problem of housing people displaced by natural disaster, plagues, famine, political and economic strife or war. It is intended to serve returning refugees who come home and find their house partially or fully destroyed. This type of transitional housing bridges the gap between temporary tent shelter and permanent home. 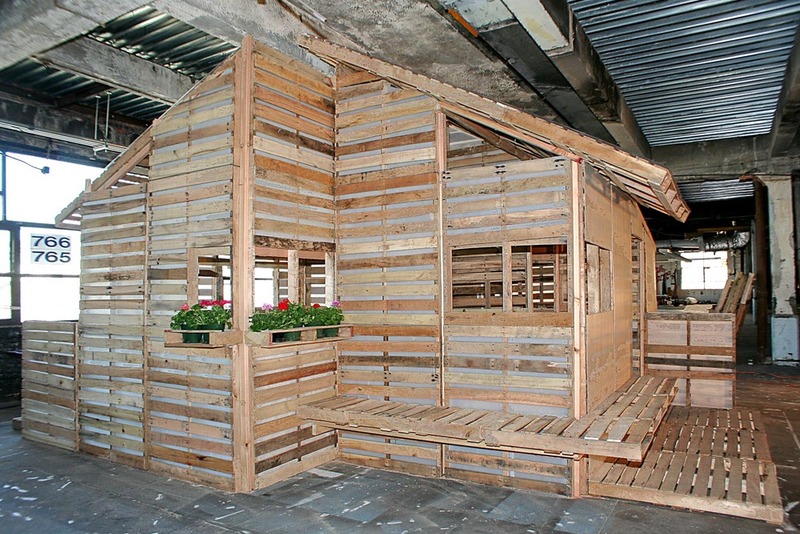 The Pallet House is made of wooden shipping pallets. Pallets are versatile, recyclable, sustainable, easily assembled and universally esthetically pleasing. They are readily available in most countries and their transportation cost and weight is negligible when used to carry shipments of clothing, food, medical supplies or other relief aid. A simple pallet structure evolves naturally from emergency shelter to permanent house with the addition of more stable indigenous materials like rubble, stone, earth, mud, plaster and concrete. The evolution of one 16' by 16' shelter into a permanent home requires approximately 100 pallets nailed or strapped together and lifted into place. Tarps draped over the basic structure or plastic corrugated sheets prevent water penetration until enough debris, stone, mud, earth, wood or any material from the immediate surroundings can be gathered to fill the wall cavities and cover the roof. Pallets may be pre-assembled with styrofoam insulation, vapor barrier, plywood or corrugated sheathing prior to shipping as well. As infrastructure is restored and cement or other materials become available the filled pallets can be covered with stucco, plaster, or roofing tiles transforming the makeshift shelter into a permanent home within a year or two. 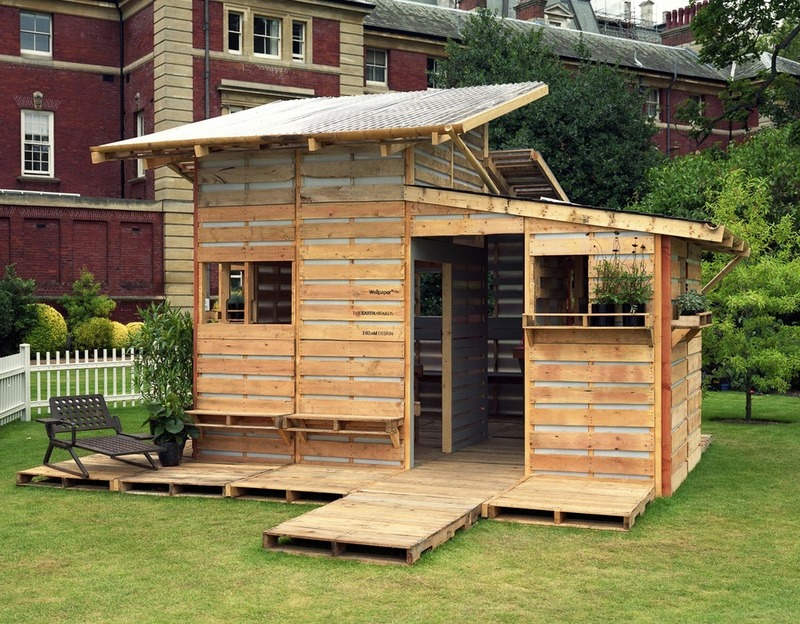 Consequently, the Pallet House adapts easily to almost every climate on Earth, and can be built in less than a week. Pallets or skids, typically used for shipping are inexpensive to make and can be pre-assembled by hand at a rate of 200 per day per worker. They are readily available in most countries around the world, and their size, strength and weight is specifically designed for transportation. The pallet module provides great flexibility in terms of configuration, allowing each family to build according to their own needs. The size and layout of each home can evolve over time encouraging the participation of the community that lives in the houses. 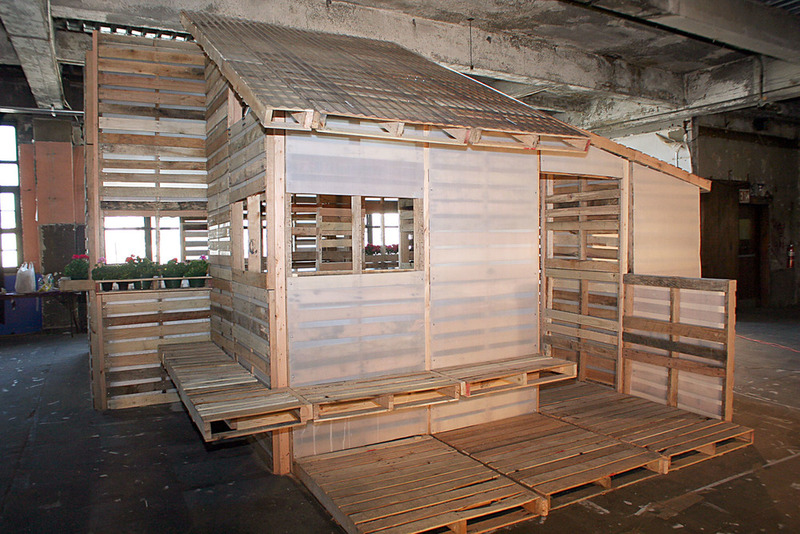 The Pallet House won an Honorable Mention in a competition to design transitional housing for the returning refugees of Kosovo. It was featured in the New York Times article on Architecture for Humanity, Spain's Sunday magazine "El Pais" as one of the few projects in the 2000 Venice Architecture Biennale on-line exhibit to successfully address the exhibition theme "Less Aesthetics, More Ethics", and was published in the book "Design Like You Give a Damn". 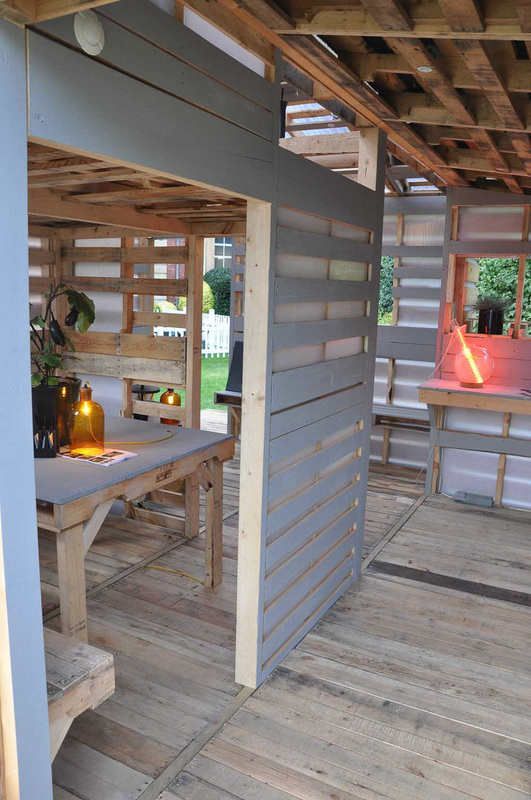 The Pallet House has received grants from NYSCA and the LEF Foundation towards design development. 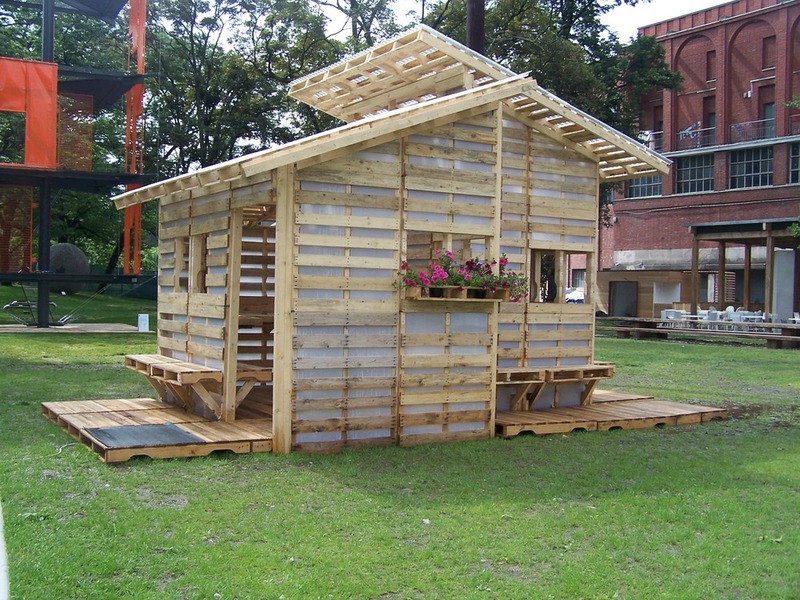 Most recently, I-Beam Design was invited to build a full-scale Pallet House prototype for the Casa per Tutti Exhibition (May-September 2008) at the Architecture Triennale in Milan, Italy where other prototypes by Massimiliano Fuksas, MVRDV, Kengo Kuma and Alejandro Aravena and Red Cross Shelters were also featured. 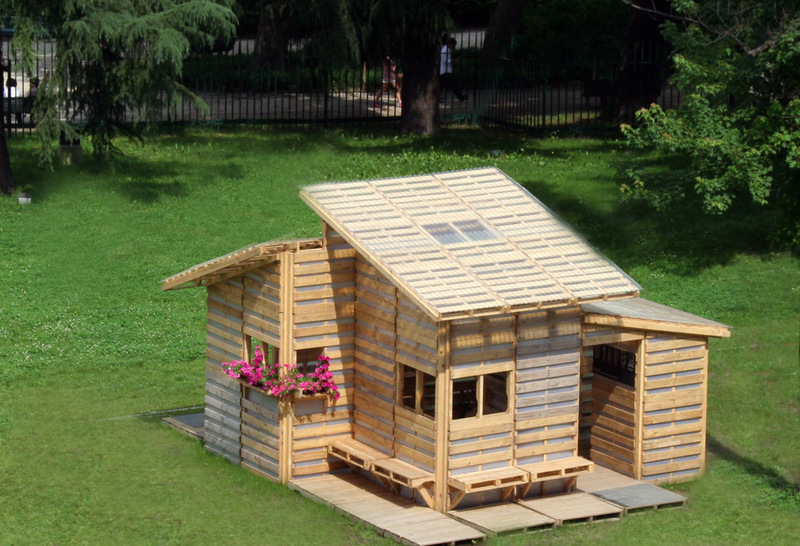 A similar prototype of the Pallet House was recently built in New York City and will be on display in one of Manhattan's downtown parks. Architecture, design and construction have a huge impact on the environment and society. The recent events in China, Myanmar, Iraq, Darfur, Afghanistan, Katrina have unfortunately made us all the more aware of the symbolic, cultural and physical power of buildings. But there is another more pressing architectural crisis that affects all nations, and that is the question of housing of the 1 billion people who live in substandard housing around the world. 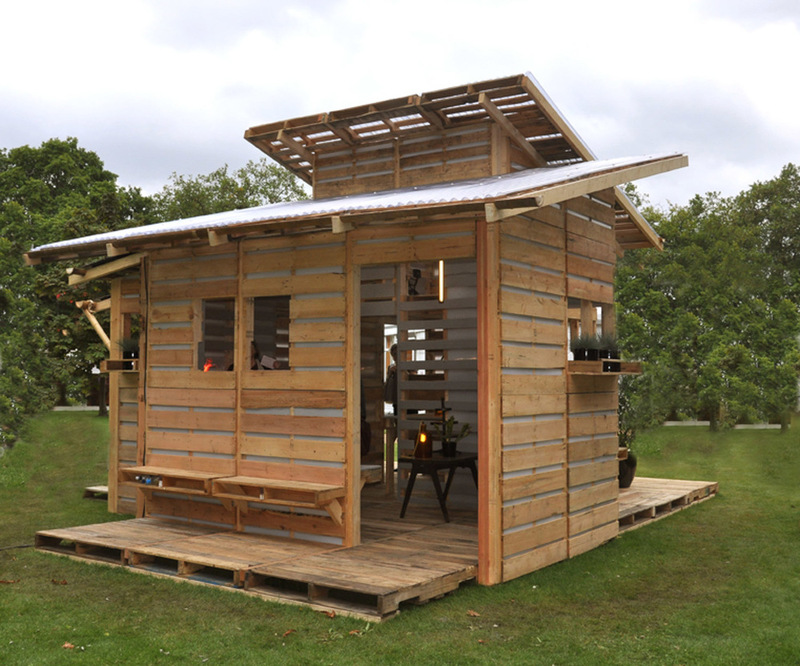 The Pallet House provides a viable solution to the housing crisis while simultaneously empowering individuals with simple materials and tools to rebuild their lives as they see fit. 21 years of civil war has left 1.5 million people in Somalia internally displaced. Pallet House is an inexpensive, efficient and easily assembled shelter for people displaced by natural or man-made disasters. 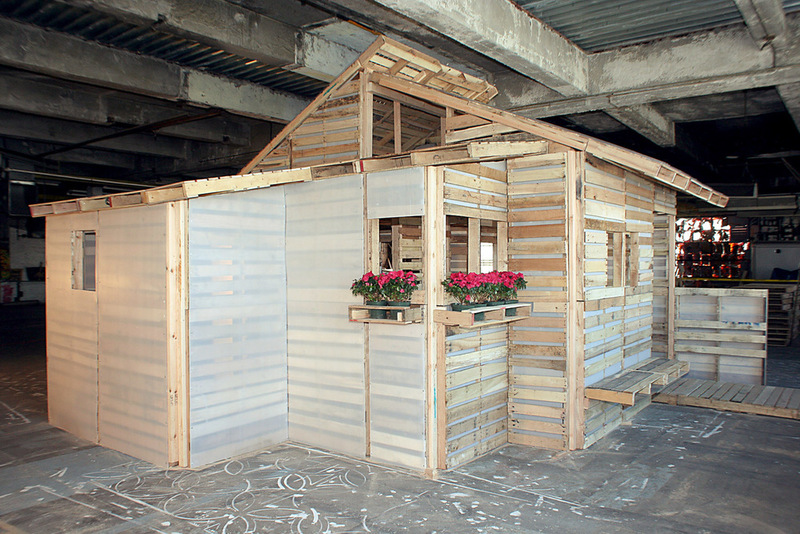 A pallet structure evolves from emergency shelter to permanent home with the addition of locally available materials like mud, plaster, concrete or corrugated sheathing. 60 pallets nailed together makes an 83 square foot shelter. PARTICIPANTS: 35 students including undergraduate, graduate and recent graduates as well as four faculty members from Ball State University's College of Architecture and Planning participated in the workshop. Students and Faculty were assigned into six teams with a designated team leader. 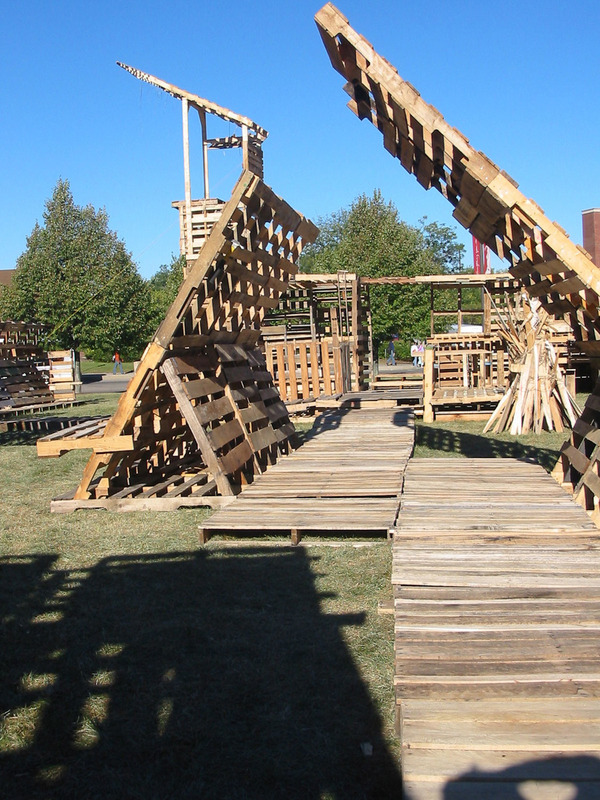 LOCATION: Each team designed and built one Pallet Structure on the lawn in front of the Human Performance Lab, just across from the College of Architecture and Planning Building at Ball State University, Muncie, Indiana. Each lot measured 20'x30' (or 6 pallets x 9 pallets). Students were free to build within their lots as they wished. DURATION OF WORKSHOP: Students designed and built six (6) Pallet Structures in four (4) days. The Workshop began with a brief design charrette on Friday September 17th. The six individual structures and public spaces were complete by Monday morning September 20th. The structures stood for 2 weeks before being disassembled by the students. The students and faculty used the structures for teaching, studying and socializing during the day. At night, a few students or faculty members slept in the structures for the duration of the project. MATERIALS: Nearly 500 wooden shipping pallets were used during construction of the 6 structures. 250 4-way 40"x40" recycled pallets were donated by IFCO Systems of South Indianapolis. Students collected approximately 250 additional abandoned pallets of varying sizes from in and around Muncie. Each Group had approximately 80 pallets to build their structure. The six structures at Ball State were built using hand tools only. The main tools were hammers, crow bars and strapping tools along with nails and metal or plastic strapping material. If we had bought the pallets the total cost of a structure would be about $400 for pallets plus $80 for hardware = $480/ structure. DETAILS AND CONSTRUCTION METHODS: Students were asked to design and detail with the "pallet" module. They considered the relationship of the pallet to the scale of the human body and made photo studies showing these discoveries. Then they came up with detailing and construction methods that could be used throughout their structures. Some students used nails, some used metal or plastic strapping material, and others came up with interesting geometrical connections by slipping one pallet through another. The goal was to create a sense of community through design by making specific types of spaces that relate to each other and to the other structures around them. These are critical issues in refugee communities as well. In response to the massive destruction of homes washed away by tsunamis in Southeast Asia, India and Africa following the earthquake on December 26, 2004, I -Beam Design has developed a proposal for inexpensive, efficient and easily realizable homes for the people left homeless by these tragic events. By adapting the Pallet House concept originally conceived for the returning refugees of Kosovo to the particular needs and building methods of Sri Lanka, the Pallet House provides an immediate and permanent alternative to the typical tent. 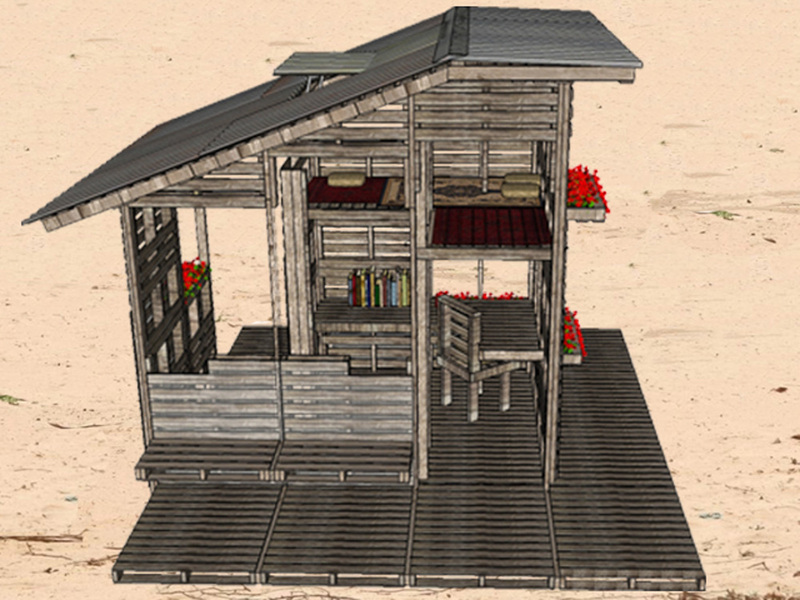 The Pallet House Prototype for Sri Lanka is a 2 story structure with 5 rooms including 2nd floor bedroom/veranda, indoor/outdoor porch/kitchen plus a central courtyard. The Pallet House Prototype for Sri Lanka uses approximately 300 pallets in total and has about 1200 square feet of floor area built on a continuous foundation wall of locally quarried granite stones and mortar. The floor is made of solid surface pallets with no space between top layer boards. Floor pallets are nailed to each other in a running bond pattern and to sill plate. Walls consist of Standard 2-way pallets nailed and strapped to each other, floor and ceiling. They are covered in Wattle and Daub (Wattle, flexible twigs or branches, is woven into pallets to create a base for the daub. Daub is a mixture of locally available mud consisting of clay, lime or chalk as a binder and earth, sand or stone as aggregate with straw or grass used as reinforcement. The daub mixture is applied by hand to the exterior and interior wall surfaces of the house. The Roof is made of solid surface pallets, A layer of building felt is applied to the exterior surface of the pallets. Locally available clay roofing tiles are nailed to the roof pallets. In the case of long span roofs pallets should be attached to trusses made of long timber beams to maintain rigidity. Built-in pallet furniture such as closets, countertops, seating, tables and beds can all be easily assembled out of pallets. The basic pallet structure for a 300 pallet/1200square foot house should take a family of 6 approximately 2-3 weeks to erect. Finishes and furnishings may take longer. The Palette House is an inexpensive, efficient and easily realizable solution to the problem of housing people displaced by natural disaster, plagues, famine, political and economic strife or war. This proposal won an Honorable Mention among hundreds of entries from around the world in a competition to design transitional housing for the returning refugees of Kosovo. The competition guidelines defined transitional housing as that which bridges the gap between temporary tent shelter and permanent home. They stipulated that the house last about five years, the time it takes a Kosovar family to rebuild a typical stone house. The Palette House is made of wooden shipping palettes. Palettes are versatile, recyclable, sustainable, easily assembled and universally esthetically pleasing. Their transportation cost is negligible when used to carry shipments of clothing, food, medical supplies or other relief aid. A simple palette structure evolves naturally from emergency shelter to permanent house with the addition of more stable indigenous materials like rubble, stone, earth, mud, plaster and concrete. The evolution of one 10' by 20' shelter into a permanent home requires approximately 80 palettes nailed or strapped together and lifted into place. Total material costs including hardware equals approximately US$500. Tarps draped over the basic structure prevent water penetration until additional materials are collected. Within about a month enough debris, stone, mud or earth from the immediate surroundings can be gathered to fill the wall cavities and the roof covered with corrugated metal, wood or straw. Where severe weather persists palettes may be pre-assembled with styrofoam insulation, vapor barrier, plywood or corrugated sheathing prior to shipping. As infrastructure is restored and cement or other materials become available the filled palettes can be covered with stucco, plaster, or roofing tiles transforming the makeshift shelter into a permanent home within a year or two. The palette module provides great flexibility in terms of configuration, allowing each family to build according to their own needs be it simple patching of roofs, completion of a partially standing structure or an entirely new home. 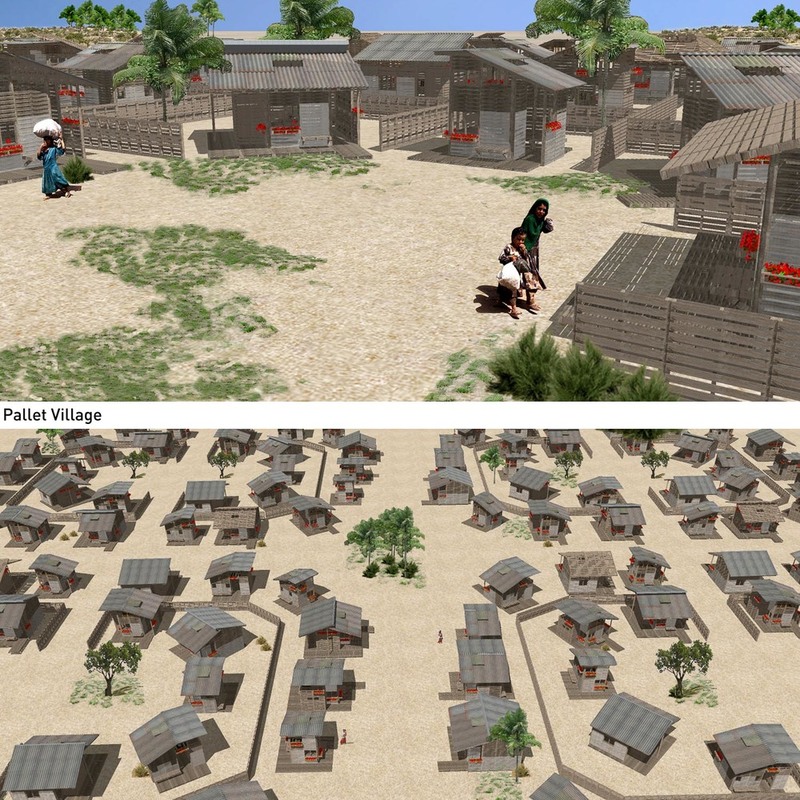 The size and layout of each home can evolve over time encouraging the reconstruction of family and village clusters to develop naturally as they have for centuries throughout Southern Europe. The Palette House adapts easily to almost every climate on Earth.